Seven of Cups Tarot Card Meaning - All Explained HERE! The The Seven of Cups is the seventh card in the suit of Cups. The card is all about choices. 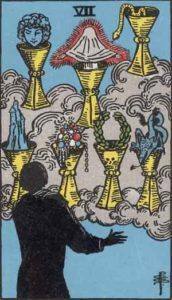 The character is having a vision of 7 cups offering 7 different gifts and is having trouble deciding. One of the choices is different from the others; an objected veiled in a cloth. We can interpret this as viewing the future and the clouded choices that we make based on appearance and assumption instead of fact. The The Seven of Cups represents almost overwhelming choice, decision and a general feeling of wishful thinking. Past – The The Seven of Cups in the Past position means you might have wasted a lot of time in your past being indecisive. Sometimes, when there are too many choices we can become overwhelmed. Use past lessons if you’re facing a similar situation now. Likewise, don’t think about the other choices you could have made. You can’t change it now. Do the best with what you have. You may need time to examine your feelings to make a decision, but try to actively do this instead of keeping it in the back of your mind. Present – The The Seven of Cups in the present position means you might currently be overwhelmed with an abundance of choice. it might be too much, and each one may seem just as promising as the other. You have to cut down your options and choose which is best. There may even be no bad choice, but the key is to remember that you will have to make a decision; you can’t have it all. It’s frequent in our lives that one choice may negate the option to choose another; choose on job over the other, choosing a partner eliminates other choices. Sometimes we don’t even go with the correct decision, but remember if you do not make a decision, then more often than not, a decision is made for you. Future – The The Seven of Cups in the future position suggests an upcoming touch choice. You might have trouble deciding and it’s going to be a big drain on you. Right now you’re leading up to it, so if you know what it is, prepare now. Rule out what you don’t want. Consider anything upcoming, what are the best paths you could take? It might be that one aspect of your life will be worse off after any choice, so look again to what you might have to give up. Work / Education – The The Seven of Cups in regards to work or education means you need to be decisive. If you’re picking a course, dedicate some quality time to how it will benefit you. Has it been good for other people? You have to make a decision. Again, in work, you might need to make a call that will help some and hurt others. Try to do what is best. Sometimes you can’t save everybody. Likewise, if somebody else is making this decision, there is a chance you won’t be saved. Make sure something isn’t too good to be true, be wary of deals that aren’t properly explained. Romance – The The Seven of Cups in romance suggests there might be more than one romantic choice for you in terms of partners. Again, weigh up the options. The card is all about making a choice. What someone is presenting to you might not be how they actually are. Whichever choice, take it slowly. If you’re in a relationship, you might have the choice of something to further deepen it, or a new experience to share. again don’t rush it, make sure all the details are worked out. Friends – The The Seven of Cups in regards to friendship means that people might be taking advantage of you if you’ve hinted that you might be able to help them. Make sure your friends are genuine and presenting themselves truthfully. If you feel you are lacking in a certain aspect of life, try to become closer to those who are practising this skill. Money – The The Seven of Cups in regards to finances reminds you to stay sensible with your money for now. Make sure deals are what they say you are, and that you’re getting the best offer. Shop around if you’ve been using the same seller. If you have too much outgoing, focus again and look at your accounts. make sure everything is tidy. Health – The The Seven of Cups reminds you again to not ignore any feelings your body is telling you. Fad diets aren’t ever going to help you. Eliminate choice. Consider going vegetarian, or taking another restrictive, but healthy diet. Veganism, though a current trend, has shown many benefits for your body. It’ll limit what you can eat and make choices easier, as there are less candidates. Mentally, things should be OK, but you might be panicking over choices you need to make. Calm yourself and forget about them for a while. Take it one step at a time. Spirituality and Mentality – The The Seven of Cups in spirituality can help you think about why you’re here. Illusions and false promises are nothing to first hand experience. If you can, do things on your own. Don’t rely on second-hand reporting. Becoming overwhelmed in any part of our life can increase our stress levels and affect our decision making ability. Think before you act, but act before the choices disappear. In reverse, the Seven of Cups can represent bad choices, arrogance when facing reality and ignoring your base desires. The ego can inflate when given many options. choose what is best for you, and anybody else involved. If something seems deceptive when offered to you, this might just be the case. Examine everything thoroughly. Seven represents introspection and thought. The enneagram is a good representation of seven. The Seven of Cups in regards to numerology reminds you to spend some serious thought over your choices. They will greatly impact your life and you shouldn’t rush into any decision right now. There is a need to make a decision soon, but your first choice may not be the best. If you have many sevens in a reading, it could suggest the need to calm down and think about your situation, even if you feel the need to act now. We’ve selected live tarot readers to give you a FREE 3 Minute interpretation of The Seven of Cups! Scroll through them below and pick your favorite one.